What counts as healthy recipes? You won’t find much here that’s labelled as ‘healthy’. My parents have three biochemistry degrees between them and I grew up reading the Manual of Nutrition for fun. I can tell you all sorts of facts about nutrition and food, and what the body needs to be healthy, and I try to eat healthily myself. But it really isn’t a priority for my blog. Why, you ask? Surely we should all be concerned with health? 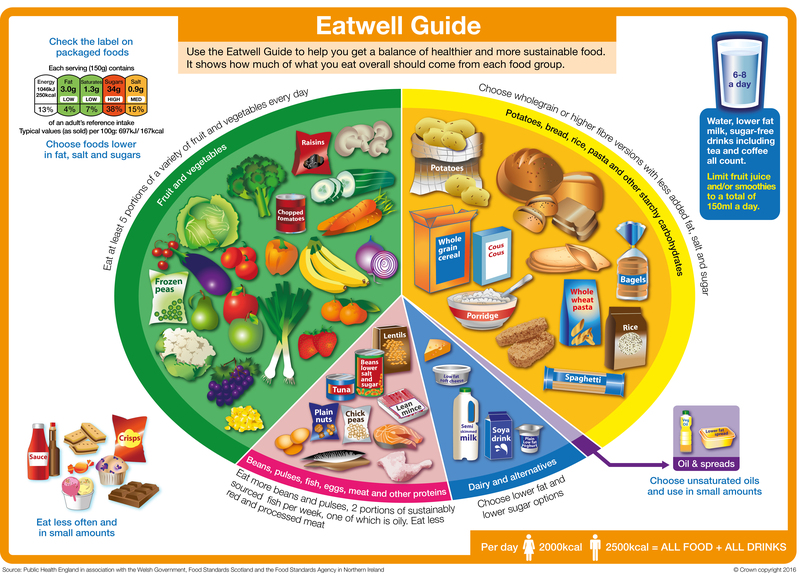 The Eatwell Guide graphic is subject to Crown copyright protection, which is covered by an Open Government Licence. Public Health England in association with the Welsh government, Food Standards Scotland and the Food Standards Agency in Northern Ireland. The emphasis on limiting fat is unhelpful though, because saturated fat isn’t the evil we once thought it is,and fat can help fill us up. Often it isn’t as simple as choosing the low fat and sugar option because there isn’t one (plain natural yogurt as it comes, anyone? ), and refined carbohydrates are worse for us than saturated fat. I also find the traffic lights on food packaging really off putting. Cheese, a nutrient dense and filling food, gets lots of red because it’s high in fat and salt, for example.In addition, everyone has different energy needs. Children should get roughly 1/3 of their calories from fat. I, on the other hand, have a large appetite in relation to my calorie needs. I therefore try and get more than my five a day when I can. I need a very different calorie density from my son, and a very different concentration of nutrients as I’m not growing. 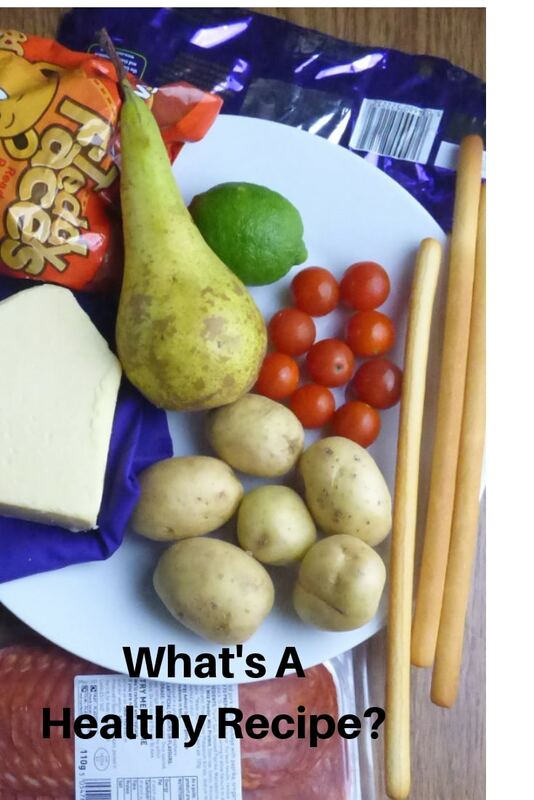 The government’s Eatwell Guide is an average, and doesn’t really tell you a lot about what any particular meal should look like. Healthy recipes for one person might be bean based, whereas to another beans spell digestive discomfort. One person may be led towards colon cancer or heart disease by too much bacon – to another it’s a valuable source of energy or iron. What makes for Healthy Recipes? I’m genuinely perplexed when a fellow food blogger puts out a request for healthy recipes.- Maybe ‘healthy Christmas recipes’ for the sake of argument. What counts as healthy?? I’m pretty sure they don’t mean nutrient dense – packed with lentils and tomato to keep your iron levels up, or zinc to boost your immune system? It’s so easy to simplify diet and health. A good diet looks different for everyone, and new research comes out all the time. At the moment many people talking about healthy recipes and food are interested in particular diets that have been in the spotlight. Many of these restrict whole food groups – low carb diets and recipes are popular at the moment. However,according to a recent study low carb diets and high carb diets can both shorten our lives. If you do your own research, you will quickly find that whilst we may benefit from eating less carbs or better types, a ‘low carb diet’ may not be wise. There are still a lot of ‘paleo‘ recipes out there, though I haven’t met anyone who is trying to follow this approach. There doesn’t seem to be a lot of evidence either way on this one yet, but I’m pretty sure the advice is not to restrict whole types of food without guidance from a dietician. I don’t want to paint an unrealistic picture of what you should all be eating. I know oven chips and fish fingers will make some of you feel guilty, and that some of you don’t like oily fish. Maybe you can’t afford the variety of fruit and vegetables that you’d like. I know achievable healthy recipes are different for everyone. So eat a range of good food that works for you, and enjoy it. Yes, for most people, all of these are healthy foods and can be part of healthy recipes. Just don’t overdo any of them. 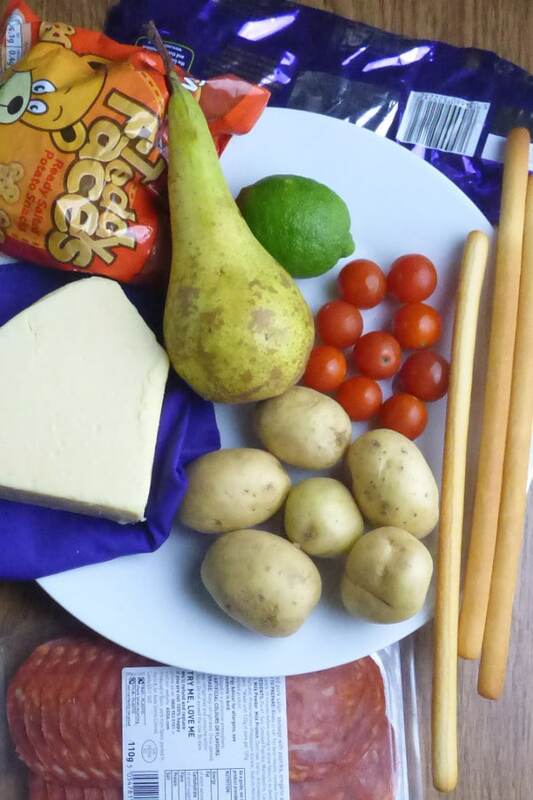 I’ve been doing some reading around food and eating recently, as we had been struggling with my son’s quite normal picky eating.We’ve changed our approach and taken the pressure off. We simply offer a selection of foods some of which we know he likes, and let him pick. We don’t pressure or force him to eat, and we don’t bribe with pudding. Some days his choices are really un-balanced, but that’s generally offset by a choice in the other direction on a different day. At the moment he’s just had (or is in the middle of ) a growth spurt and his trousers are getting loose. Therefore his choice of pitta bread, feta, full fat yogurt and hummus with a drizzle of lemon over the lot makes sense. His rejection of the ‘healthy’ cucumber and tomato – two of his favourites – is probably just what his body needs right now. If you’re interested in this approach to feeding children, click here for info on the division of responsability method. I was both surprised and fascinated to learn that restricting ‘treat’ foods in children – as that Eatwell Guide suggests, with the treat foods off to one side – can lead to worse long term outcomes in children. If children are allowed access to biscuits and cake, they learn to be moderate – there is no need to gorge when they know a food is available. And whilst as an adult I know that too much chocolate isn’t the best thing to eat, there’s usually a reason my consumption goes up. Working on de-stressing and getting enough sleep is better all round than making myself feel guilty for eating chocolate because I’m tired and stressed. If you’re on a health drive – you want to get six portions or fruit and veg a day, cut down on chocolate or eat more oily fish – good for you. Just pick something you can sustain, and something you can enjoy. My mission is to help you cook mouthwatering meals with inspiration from around the world, even on busy weeknights and jam-packed weekends. Love your food. What do you think of the Eatwell Guide – judgemental, or motivating?Do you look for healthy recipes or foods labelled ‘healthy’? What does that mean to you? Do you mostly just eat to enjoy yourself, or do you think carefully about the health impacts of your choices? Do let me know what you think over on my facebook page or in the comments section below! I agree with you Lizzie, good fats play an important role in our diet, and also give us the feeling of feeling full quicker and for longer. Also, it's worrying that more people nowadays suffer from multiple food intolerances! Indeed, fats have their place! The rise of allergies is definitely a concern.